Identification. The name Palau may be derived from the Palauan word for village, beluu (Pelew). Some trace the name to the Spanish word for mast, palao. Palau comprises several cultures and languages. Ethnic Palauans predominate, inhabiting the main islands of the archipelago. Descendants of the Carolinean atolls, especially Ulithi, settled on Palau's southern atolls of Hatohobei, Sonsorol, Fannah, Pulo Anna, and Merir. Southwest Islanders, as these Carolineans are called, speak Nuclear Micronesian languages. Today most live on Koror and also speak Palauan and English. Palauans recognize a series of expanding identities, from the village of one's father, one's mother, one's village, or one's island, to the Palauan nation as a whole. Overseas, Palauans retain strong links and identification to their homeland, while developing their own variations on Palauan identity. Shared schooling and work experiences have resulted in some elites considering themselves Micronesian. Location and Geography. Located in the western Pacific, the Palauan archipelago is the westernmost portion of the Caroline Islands, which are in turn part of the Micronesian geographical subdivision of Oceania. East of Mindanao in the Philippines, Palau is 722 nautical miles (1,340 kilometers) southwest of Guam. Palau's three hundred volcanic and raised coral islands and atolls rise up from the Philippine Plate, with the highest stone outcrops reaching about 720 feet (2,220 meters) on the largest island, Babel thuap. The islands have a total land area of 191 square miles (495 square kilometers). The weather is hot and humid, with annual rainfall around 150 inches (3,800 milimeters). The flora and fauna are tropical, but Palau is best known for its 70-mile-long (113-kilometer-long) barrier reef which encloses spectacular coral reefs and a lagoon of approximately 560 square miles (1,450 square kilometers), a divers' paradise. The capital and major population center is Koror, the small set of islands to the south of the main island of Babelthuap. In 2004 the capital will be relocated to Melekeok on Babelthuap. Demography. As of 1995 the resident population of Palau was 17,225. It was 71 percent urban. The demography of Palau must be understood in historical perspective. Estimated at fifty thousand prior to European contact, the number dropped to about thirty-seven hundred people by 1900. The population then began a slow growth that finally accelerated from 1945 through the 1960s. Fertility has stabilized at 2.1 children per woman, with a death rate of 7.4 per thousand. In the late twentieth century, the natural population growth has been counterbalanced by outmigration. While the number of Palauans has been relatively stable at about thirteen thousand, including the peoples of Hatohobei and Sonsorol, an estimated seven thousand Palauans today reside overseas for a total population of around twenty thousand. The most important demographic shift of the late twentieth century was the increase in resident foreigners, from 4 percent of the population in 1973 to 25.5 percent in 1995. The largest and longeststanding community was then Filipinos (2,654 workers and their dependents), followed by other Asians (738), Americans (535), other Micronesians (467) and Pacific islanders (232). By 1999 Asian workers had increased to 5,250.
which along with Chamorro (Mariana Islands) is considered separate from the other Micronesian and Pacific languages grouped under the label "Oceanic." English and Palauan are official languages; elders also read and speak Japanese. The Palauan language incorporates Spanish, German, Japanese, and English loanwords. Symbolism. Most of Palau's important cultural symbols are derived from its chiefly past, in particular the gable of the community meetinghouse, bai. This impressive thatched building was the center of political, social, and artistic life. Today the decorated bai gable is used in most national and state seals and to decorate Palauan buildings. Other important symbols include the circle subdivided in four, representing wealth, and the half shell symbol of the giant clam shell, which also represents the foundation of Palau and the creation of humanity from the sea. The image of the traditional Palauan mother at the time of her first child ceremony symbolizes the wealth and fertility of this matrilineal society. Symbols of nationhood include the national flag, a full golden moon on a blue background, and the national anthem. Emergence of the Nation. Archaeologists estimate that the islands were first settled approximately 4,000–4,500 years ago. Palauans participated in the wide-ranging Micronesian trade system, with some interaction with Malay traders. In the nineteenth century Palau was loosely part of the Spanish Pacific. After the Spanish-American War in 1898, Palau was among the islands sold to Germany. In 1914 the islands were occupied by the Japanese, a control later confirmed as a League of Nations Class C Mandate. The United States took possession of the islands in 1944, during World War II. Starting in 1947, Palau was part of the United Nations Trust Territory of the Pacific Islands, under the administration of the United States. Palauans chose not to affiliate with the remaining islands of the territory in the Federated States of Micronesia, instead establishing their own constitutional government in 1981. While the majority of Palauans preferred free association with the United States, ratification of a Compact of Free Association was delayed by constitutional nuclear-free clauses, which required a 75 percent suspension vote of the people to conform with the compact. Palauans also feared U.S. military land use. Between 1983 and 1991 Palau conducted seven plebiscites and experienced escalating violence, including the assassination of the first elected president. After a three-year cooling-off period, and clarifying statements by the United States on the conditions under which the U.S. military might be present on the islands, the compact was approved, the trusteeship terminated, and the nation formally recognized by the United Nations in 1994. National Identity. The concept of being "Palauan" grew during the century of colonial administration, drawing together those previously separated by villages, clans, and cultures. While the disruptions of the compact plebiscites pitted Palauans against one another, the plebiscites also cemented support for the national constitution. Ethnic Relations. Palauans are inclusive in their conceptualization of being Palauan, incorporating long-term residents according to Palauan custom. The constitution confirms the citizenship of all those of Palauan heritage. Ethnic differences between Palauans and Southwest Islanders are declining in importance in the face of increasing numbers of Asian foreign workers. Palau is highly urbanized, with 71 percent of its population residing in Koror and Airai on the south of Babelthuap. Those without land rights on Koror live on land leased from the government, generally in single- or two-story houses of wood or cement with tin roofs. The bai gable is a common architectural feature. Village communities still have bai meeting houses, a few in traditional styles. Today's government buildings are large air-conditioned cement structures. The future capital, Melekeak, is influenced by classical architecture. The national congress, named the Olbiil era Kelulau (House of Whispers), symbolizes the process of quiet consensus rather than open public debate of issues. Food in Daily Life. Palauans enjoy a strong domestic economy based on the dual importance of protein ( odoim ) provided by men and starch ( ongraol ) foods produced by women. Each clan has certain recognized food taboos, and there are special foods for titled individuals and for pregnant and lactating women. The extended family system was organized around a series of clan exchanges of food and related valuables—at the time of the building of a house, taking of a title, birth, and death. Today, imported rice is a staple food that has been integrated into the exchange cycle. A basic meal comprises a starch food, preferably soft or hard taro, tapioca, or rice, and a protein food, normally fish. Coffee and breads or cereal may instead provide a fast breakfast. While starch and protein foods still comprise the basic categories, the Palauan diet is strongly enriched by Japanese and American foods, and more recently by the various cuisines of China, the Philippines, and Korea. There are many restaurants, and local markets feature both Palauan and imported food. Beer is commonly consumed and a local brewery has been established. Food Customs at Ceremonial Occasions. Special foods vary by state, village, and occasion. In the past a special drink made from a molasses derived from coconut sap was served to chiefs and elders; it was valued for its medicinal benefits and its religious meanings. Nearly every weekend Palauan kin groups gather in the modern equivalents of clan exchanges for house parties and funerals, and to celebrate a woman's first child. Classmates and workmates also join in the festivities and exchanges. Rice and store-bought foods predominate in these exchanges, in addition to taro, fish, and pork. Basic Economy. The production of root crops and fishing still provide a strong basis for the Palauan economy. Large taro swamps are worked by women in each of the villages, and men fish primarily from large outboard motorboats. Foreign workers are now employed in the farming and fishing industries and also work in household food production. On this subsistence basis there is a strong wage economy. Of the Palauan population sixteen years of age and older, 58 percent are engaged in wage labor, with a male participation rate of 68 percent and female rate of 51 percent. About 40 percent work in the government sector. Payments associated with the Compact of Free Association between the United States and Palau accounted for 55 percent of 1999 revenues. These payments began in 1994 and are front-loaded within the fifteen-year agreement. Major infrastructural development projects are funded by the compact and by international aid. Land Tenure and Property. In the past, lands, titles, and wealth were held by the clans and controlled by senior female and male elders; in this matrilineal society, however, those related through a senior female had a stronger say in such areas than those related through a man. Each clan controlled taro fields, a named house plot, and other lands. There were certain village lands: those for the chiefly meetinghouses, men's clubs, and dock houses, as well as some public lands. Certain lands could also pass individually from a father to his children. The majority of lands were alienated during colonial control; these lands were returned to Palau in the 1980s. Certain lands were retained by the new nation for public buildings such as the hospital and government edifices. Otherwise, land may be owned only by Palauan citizens. 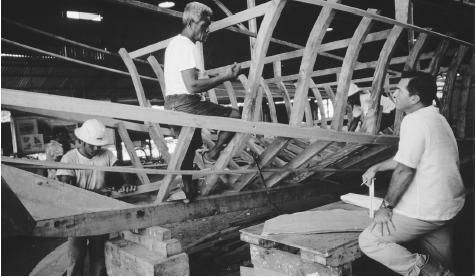 Men building a wooden boat. Fish are Palau's main export, and the annual catch may be up to 780,000 pounds (291,000 kilograms). standard for Palauan money. Commercial activities have been added to the traditional economy. Raw and cooked foods are prepared for sale in markets and stores. Carved storyboards are produced for sale mainly to visitors. A full range of contemporary commercial occupations have been added, mainly in retail sales, construction, and housing services. Major Industries. The major industry at present is the construction of public infrastructure, funded by the Compact of Free Association and foreign aid. Tourism and fisheries are major export earners; agricultural production is primarily for local consumption. Trade. Importation of capital goods associated with infrastructural development constitutes over half of all imports, with imports of foods and live animals at 13 percent. Imports are primarily commercial, totaling $65.9 million (U.S.) in 1998 (a decline from $79.6 million [U.S.] in 1996). Total exports, composed of predominantly fish, were $3 million (U.S.)in 1996. The annual fish catch fluctuates between 500,000 and 780,000 pounds (186,500 and 291,000 kilograms). Tourism is the country's fastest growing industry, with foreign visitors increasing nearly threefold from 23,398 in 1990 to 54,745 in 1999. It is estimated that tourism contributed $65 million (U.S.) to the economy in 1995. Division of Labor. Except for certain highly specialized tasks such as master builder, master fisher, or master farmer, men and women of all ages traditionally performed basic productive tasks, moving into management positions in the clan and village as they aged. The main division of labor at this time is by nationality, with Palauans and Southwest Islanders holding the primary positions in the governmental sector—in management and the professions—with increased participation by foreigners in private sector positions. Filipino and Chinese workers are primarily engaged in production and service occupations. Class and Castes. In the past, members of the highest ranking clans of the village were also the wealthiest, controlling state and village as well as clan monies and resources. Leaders were responsible for caring for their descendants and dependents. The chiefly system is declining as new systems of stratification based on educational attainment and wealth develop in concert with increased participation in the world economy. Foreigners generally fit into the stratification system according to the level and status of their wage-paying job. Symbols of Social Stratification. In the past there were few symbols of social stratification, other than women wearing Palauan money pieces around their necks, chiefly men wearing a dugong (sea cow) vertebrae bracelet or adze. Today fine clothing, houses, fast speedboats, and four-wheel-drive cars are signals of personal achievement. Government. The Palau national constitution was ratified in 1981. It is modeled on the United States constitution with a popularly elected president and vice president, two-house National Congress, and a judiciary. There are sixteen states based on historical village-states, each with a governor and state constitution. Leadership and Political Officials. The president and vice president are the highest recognized elected officials. There are no political parties. The Ibedul of Koror and the Reklai of Melekeok continue to be recognized as paramount chiefs of Palau. The states are comprised of a number of villages, each of which has its own male and female chiefly councils. A council of chiefs from each state advises the national government. At the state level both elected governors and traditional leaders are recognized. The level of integration of the elected and traditional leadership varies by state. Social Problems and Control. There is a national police and judiciary. Palau is experiencing many of the social problems of societies undergoing rapid transformation. High consumption of alcohol contributes to accidents and assaults especially involving young men. Marijuana is grown and sold in the islands, and imported drugs such as "ice" (cocaine) are a problem among the young. The paramount chiefs are working with government officials on youth programs and programs that aim to control alcohol and drug use. Military Activity. 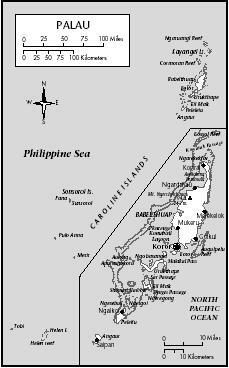 Palau does not have a national military, although the young men's clubs of the village-states are still active; in the civil unrest of the 1980s these clubs were often called in to establish and maintain order. Some Palauans do volunteer for service in the various branches of the U.S. military. The constitution mandates a strong program of health and educational support. Education is free and mandatory through high school (grade twelve), with support services for those who do not graduate. Private religious elementary and high schools (including Catholic, Protestant, Seventh Day Adventist, and Palauan Modekngei) are supported by school fees as well as government contributions. Medical services are provided at low cost through the Belau National Hospital and clinics, and there are several private medical clinics. There is a national social security system for those who have contributed through taxes upon their wages, and there are both government and private retirement programs. Semigovernmental nonprofit organizations include a community action agency, head start programs, and the Belau National Museum. Environmental concerns are strongly represented by the Palau Conservation Society, and local offices of the Nature Conservancy. Division of Labor by Gender. In the past there was a strongly gendered division of labor in daily work tasks, with men in charge of fishing and the construction of houses and community buildings, and women in charge of farming and shellfish collection. Today both men and women are active in wage labor, and gender is of little importance except in national political offices, which are rarely held by women. There are women physicians, lawyers, and business managers, and the first Palauan woman serves on the Palau Supreme Court. The Relative Status of Women and Men. Palauan society recognizes complementary roles for men and women. The traditional governing village council was male, with a female chiefly counterpart council. Senior women were integrally involved in leadership: they selected (and could remove) the male titleholders. Senior women still have strong voices in clan decisions on property and wealth controlled by the matrilines, because money from exchanges enters the clan through the woman. Changes in legal inheritance, however, are eroding women's power. 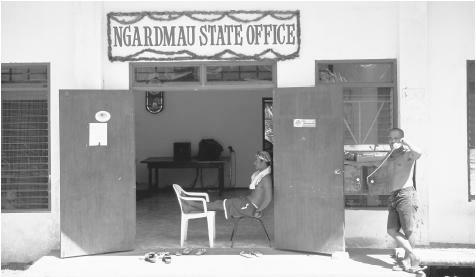 The Ngardmaun State Office Building in Babeldaob Island. Palau's government is modeled on that of the United States. Marriage. In the past marriages were arranged, with intermarriage among members of the high clans, but at present, individuals may select their own partners. Within the clan marriage is not permitted to relatives reckoned through either the father or mother to four generations. Marriage may be formalized through the court, church, and/or traditional ceremonies involving the exchange of prescribed foods and wealth between the clans. Divorce is common, especially among younger couples with few children, and may be initiated by either husband or wife. In the past most adults would marry; today, there are increasing numbers of single or widowed individuals. Domestic Unit. The basic unit is the telungalek —people descended from one woman. In the past households were comprised of three- or four-generation extended families. Today, there are increasing numbers of nuclear family households, particularly among the young. Inheritance. Lands, titles, and wealth traditionally passed through the matriline, with decisions made by senior female and male elders. Today, social security payments and intestate estates pass to the wife and children of the deceased, a major transformation of inheritance practices. Kin Groups. Beyond the telungalek are recognized lineages and clans that may extend beyond the village or state. Certain clans are associated by past histories. Infant care. At the time a woman's first child is born there are special ceremonies: her female elders gather, organize a series of hot baths, and present the young woman to the community in a public ceremony. During this time the infant is cared for primarily by female relatives, who bring the child to the mother for nursing. Care of infants is dispersed among family members, and it is common for children to be adopted by their grandparents. Men are active in caring for their young children, especially boys. Child Rearing and Education. In the past, children learned through observation and working alongside adults. Today there is a formal education system beginning generally with head start or kindergarden classes, followed by elementary and secondary schools. Higher Education. Secondary education is universal, with most Palauans bilingual in Palauan and English. There is a two-year Palau Community College which trains students from throughout the region and also feeds into four-year systems predominantly in Guam and the United States. Palauans enjoy high standards of education and literacy. Respect toward elders and leaders is still pronounced. In particular the head is considered sacred and should not be touched. Religious Beliefs. Christianity has been established in Palau for the past century, with Catholic (44 percent) and Protestant (29 percent) churches predominating. There is also a syncretic Palauan religion, Modekngei, which in 1995 accounted for 11 percent of the people. Palauans still recognize Palauan gods and their totemic embodiments, refraining from eating clan totems. Christian beliefs and indigenous practices often coexist. Religious Practitioners. Ordained priests, pastors, and Modekngei leaders are highly respected leaders of religious ceremonies, and there is strong lay and community involvement in the churches. Rituals and Holy Places. Major Christian rituals and holy places are recognized, in addition to indigenous village-based shrines. Death and the Afterlife. Funerals remain one of the most important of all Palauan rituals. As in the past this is the occasion for a major gathering of the lineages and clans, organized primarily by the female elders. Transfers of food and wealth are made to settle the affairs of the deceased and for a deceased man, the obligations to his wife and children, who return to the woman's natal house. Although general graveyards were established in the nineteenth century by colonial administrations, it is still common for an individual to be buried in the stone platform of the house or lineage. Local Palauan medicines of leaves and herbs and Palauan medicinal and massage practitioners are still valued, although Palau has also fully incorporated Western medicine. The Belau National Hospital provides a high standard of services, relying in some cases on medical referrals to the Philippines and the United States. There are male and female trained physicians and surgeons, as well as nurses. There is an active dental service and village-based public health services. Palau celebrates a range of national holidays including Constitution Day (9 July) and Independence Day, many American holidays, as well as an extended Christmas/New Year's period. Support for the Arts. The Belau National Museum, which opened in 1955, was begun privately with strong local support. The government of Palau is considering funding a new national museum as part of the capital relocation project. Palau has twice sent delegations to the Pacific Festival of Arts and will host the 2004 festival. Literature. Poetry is the most developed of Palauan literary arts (in Palauan and in English), with several well-known poets; little is available, however, in published form. Graphic Arts. The graphic arts are highly developed in Palau. In the past the village meetinghouse was the center of both visual and performance arts. The end gables (bai) of these houses and the interior beams were decorated with low-relief painted carvings, depicting histories of the village and its relationships with other villages. 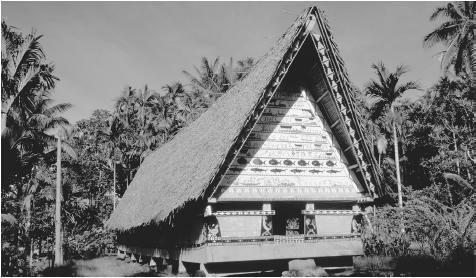 Most of the older houses (depicting sailing ships and planes as well as Palauan scenes) were destroyed during World War II or by typhoons, and the few extant and newly constructed gables today depict pre-European Palauan styles. Carved wooden storyboards, derived from the beam carvings, are a highly developed art form, primarily for sale to foreigners. Carvers of storyboards, shell jewelry makers, and weavers may earn considerable income. Watercolors of traditional village scenes by the late Charlie Gibbons are highly prized. Palauan artists also work in oils and linocuts. Palm trees surround a traditional men's house. The bai gable is an important cultural symbol. a number of musical genres. In village meetings there are also informal theatrical skits and clowning in informal dancing. Contemporary Palauan music is composed and performed in nightclubs and on public occasions, with local diskettes and CDs offered for sale. Palau has long been a site of research in marine biology, building upon the scientific skills of Palauan master fishermen. Scientists at the Micronesian Mariculture Demonstration Center were the first to successfully spawn giant clams in a laboratory environment, and to develop programs to build stocks of endangered hawksbill turtles. The Palau International Coral Reef Center for scientific research, coral reef management, and educational programs, funded by Japan, is due to open in 2001. A private Coral Reef Research Foundation studies the biochemical properties of marine invertebrates, especially sponges, in cancer research. The Palau Ministry of Community and Cultural Affairs—which includes the Palau Historic Preservation Office, Belau National Museum, and Ministry of Education—operates aggressive programs in cultural conservation, counteracting strong American influences in education. In conjunction with the construction of the Babelthuap road, major archaeological and oral history projects are under way. Nero, K. L. "The Breadfruit Tree Story: Mythological Transformations in Palauan Politics." Pacific Studies 15 (4): 199–209, 1992. —— and N. Thomas. An Account of a Voyage to Pelew, 2001. Parmentier, R. J. The Sacred Remains: Myth, History, and Polity in Belau, 1987. Ramarui, D. The Palauan Arts, 1980. Republic of Palau. Office of Planning and Statistics. Statistical Yearbook, 1999, 1999. Smith, D. R. Palauan Social Structure, 1983. Yamaguti, O. The Music of Palau: An Ethnomusicological Study of the Classical Tradition, 1967. Zobel, E. The Position of Chamorro and Palauan in the Austronesian Family Tree: Evidence from Verb Morphology and Morphsyntax. Paper presented at the Eighth International Conference on Austronesian Linguistics, Taipei, December 1997. I found this very informative and it answered most of my questions. Thanks!! Great article. I was there in the late 70's as a physician in training from the internal medicine training program in Hawaii. At that time there were no paved roads and the terminal at the airport was an open air thached hut. The first bridge to town was still under construction so you had to take the barge. There were many old chiefs with tattoes from head to toe. One of the only motorized pleasure boats was owned by the hospital. I had my own boat driver and after making hospital rounds we would take the boat out to see patients in various villages....then we would go spear fishing. I have some great pics I could share. im from palau so i knew most of this stuff. it taught me stuff i didn't know though. this is interesting. Keep up the good work! Palau is a perfect example of a developing country experiencing hyper development, moreover, it is evident that these changes are eroding family, cultural and social values. Drawing from the a comment posted here by Ron Levy, much has changed since the 70's. I suspect the challenge for this country is to become self sustainable in the long run without depending heavily on foreign assistant to subsidize economic activity. A great place to start is how to generate jobs that would be attractive for educated young adults to return home and contribute to this society. I'm doing a Power Point Presentation, and I was wondering If someone from my beautiful Island of Belau help me. I LEARNED ALOT THAT I DIDNT KNOW WHICH IS COOL.MY MOM WAS BORN IN PALAU . Im a proud Palauan and appreciated all the factual information. I can actually tell my fellow foreign friends to read this because its interesting and well put together. Continue the awesome work! This is very interesting. i didn't know much about our culture but now i truly understand not all of it but most of it. I want to meet my real dad. I am guamanin an I haven't seen or heard from him. I am almost forty and I want to see him. If anyone can help me my number is (316)559-5584. Thank you. My name is chris tulop. Thank you and I hope my dad gets this before anyone. Love you dad no matter what happend or happens k . Love you. My dad name is emmanuel tulop and my mom name is debbie castro. i like reading the culture,dressing and dancing that palau has i did enjoy my self watching thier images and videos. i hope to read more on this next time. To Ron Levy, I would love to see those photos of yours. I am Palauan and I was raised in the States since a very young age. I have slight memories of the old days, well not quite 70ish but towards the 80's and during the transitioning stages I guess I would call them. I would really love to see those pictures that you have. I would like to see how it looked like back then. Respond if you read my comment thanks. I'm Palauan, too and I'm pretty impressed with the accuracy of this information. Most documents written about us contain at least a few errors, but this was written well. Whoever wrote this did great research! this was so informative! it answered all of my questions. it was even enjoyed reading it! Answered all my questions. Will be returning to this site in the future. I highly recommend Every Culture. This was very interesting and useful. I have a research paper to write and these information would be of great use... I also did not know much about my own culture and I am glad that I would get the chance to research on it and tell people about it. Thank you so much! This was of great help in my term paper in Economics. Hi. In my homeland, Sabah Malaysia, there are Bajau Laut, also known as the Pala'u people. Mainstream researches suggest that they are from the Philippines. Anyways, I wonder if these people are somehow related to Palau, or perhaps even originated from Palau. Has any academic research been done on this? If yes, i would love to know about it. Thank you. Oh, by the way, i read in wikipedia about Palau, and found out that Negrito people once dominated Palau, before they were displaced 900 years ago. For your information, Negrito people are also one of the indigenous groups in Peninsular Malaysia. Most of them still live in remote rainforest areas. I'm writing a short book about Palau and would like to include some of your information. If that is okay with you it would greatly be appreciated. I'm writing this book for school so we can write a book on something that interests us. We also are going to try and publish our work so I would like to get your permission. It is very imformative and beneficial to high school students especially those who majored in Tourism & Hospitality. I'm an ordained minister here in the united states of america. do i need a ministers licence or register my information to the government there in palau? to do a wedding ceremony in palau? I'd like contact for anyone in Palau who might have information for Mbuke Island relatives who settled in Palau many years ago. Mbuke Island is in Manus province in Papua New Guinea. It's really interesting about their culture and planning to visit palau and hoping to meet a Filipino ftiends. I am Palauan, born and raised. I really appreciate writers who do their research. Thank you! You did an awesome job on my country. Well written, information are accurate, and very ethical (professional). My father was part of the Comprehensive Inventory of the Micronesian Islands study 1947-1948 as a member of the University of Oregon anthropology team. His main efforts were to record the language and customs of the people. He spent the year in Uliman in Ngaraard on the east coast. I recently found his notes and his dictionary and am in the process of transcribing them. A sample can be found as a comment on Google Earth view that shows a photo of the Elementary School. He describes the graduation ceremony of what must have been the first graduating class. For years, he talked about his life there and the man across the trail named "Siro" or "Shiro". This was very useful I used it for my social studies as for the people in Palau I hope to visit there soon. It is very informative and beneficial to our Micronesian children as well as to those who don't know very well about our history. Thank you very much!